I’m home now, after cutting my trip short due to illness and lost baggage hassles. I’m happy to be back, and hope to spend the next 6 weeks before my semester starts getting lots of writing and revising done. 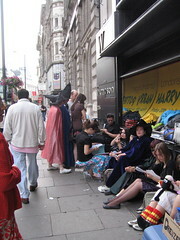 Here is a pic of crazed Harry Potter fans I saw in London on the 19th. yay! welcome back, randa. 🙂 I am sorry you had to cut your trip short–but I am going to send you lots of positive thoughts so you can get tons of inspired writing done. I just came across your blog this evening while reading through various blogs about travel, I hate to hear you had to cut your trip short. Did your luggage make it back to you ok? Have you ever seen Global Bag Tag? I don’t know your situation but they may have been able to help.